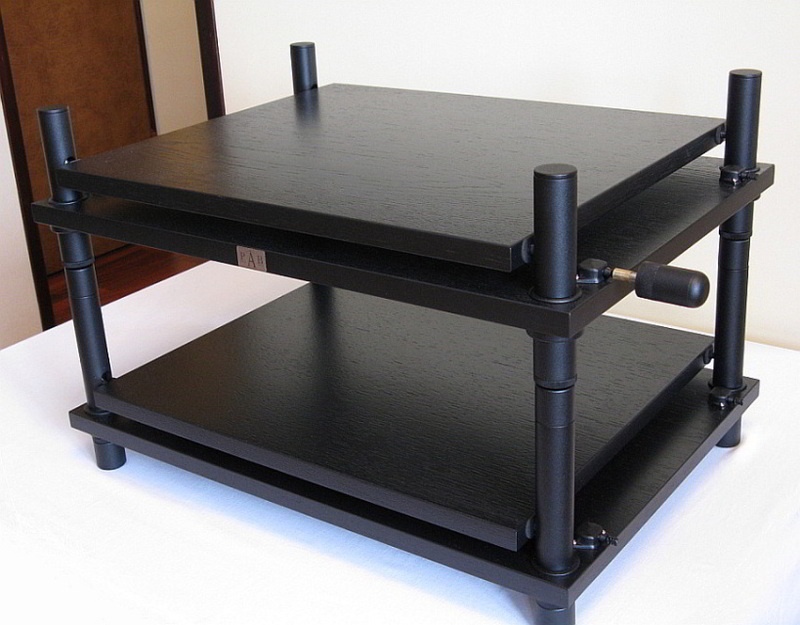 PAB basic AVP (AVP − anti-vibration platform) consists of a plinth, above which a shelf for electronic equipment is suspended. The plinth and the shelf are made from plywood, birch, alder or spruce with 0.7″ (in) thickness (with veneer the thickness increases to 0.8″). 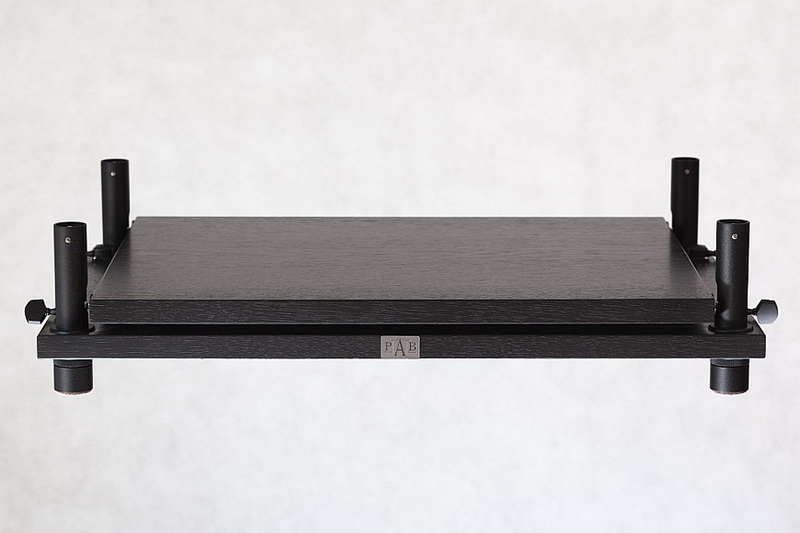 Dimensions of the plinth are 22.1 x 15.8″ and of the shelf − 18.9 x 15.8″ (we do also make platforms with a narrow and long shelf, with the dimensions of 15.8 x 18.9″, with a rectangular plinth with 18.9″ side length). 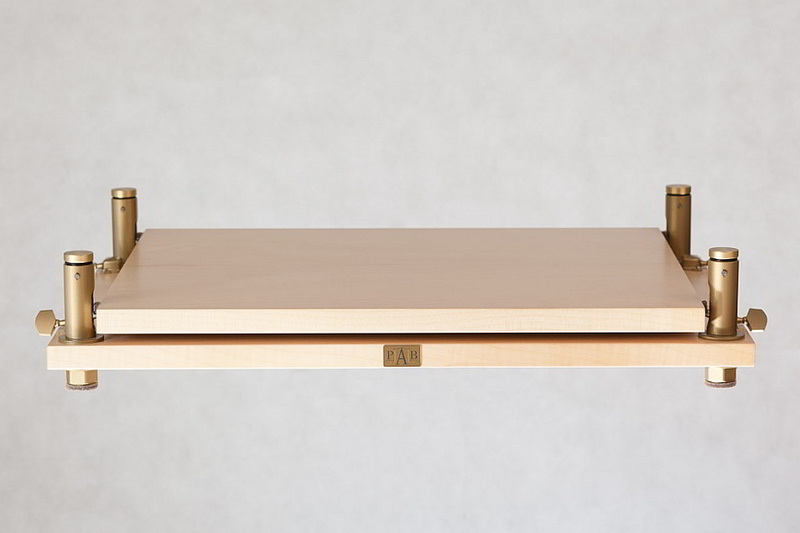 The plinth is wider than the shelves, because in the corners there are the sleeves hold down the shelf suspension mechanisms (the sleeves and feet of this platform are made from brass, steel, aluminum or bronze). The height of the basic platform, measured from the bottom of the foot to the top of the sleeves cover is almost 6.3″, while the net weight − 17.6 lb. 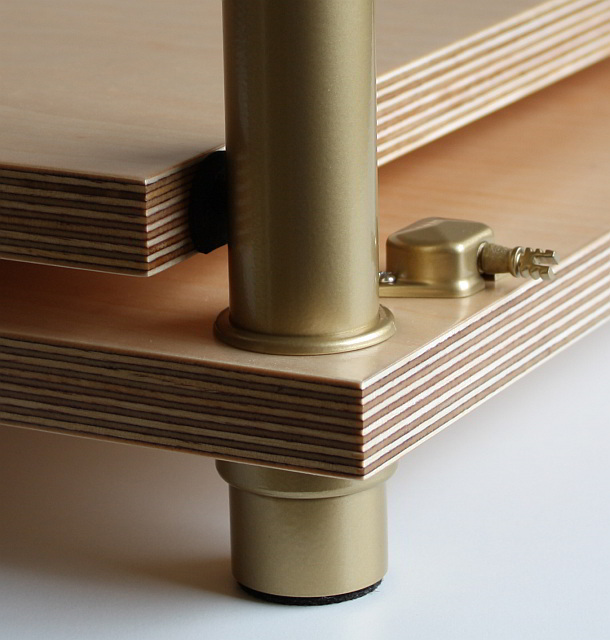 The load of the platform should not exceed 92.6 lb (the maximum load, stated on the label of each platform we manufacture, depends on the kind of plywood used for the construction). Although the PAB basic AVP is able to carry loads up to 132,3 lb, but such high loads are not recommended due to diminishing of anti-vibration capabilities of the strings, which are too strained. This means, that owners of very big and heavy equipment should chose different platforms from our catalog: special − PAB SE AVP or supported − PAB support shelf. 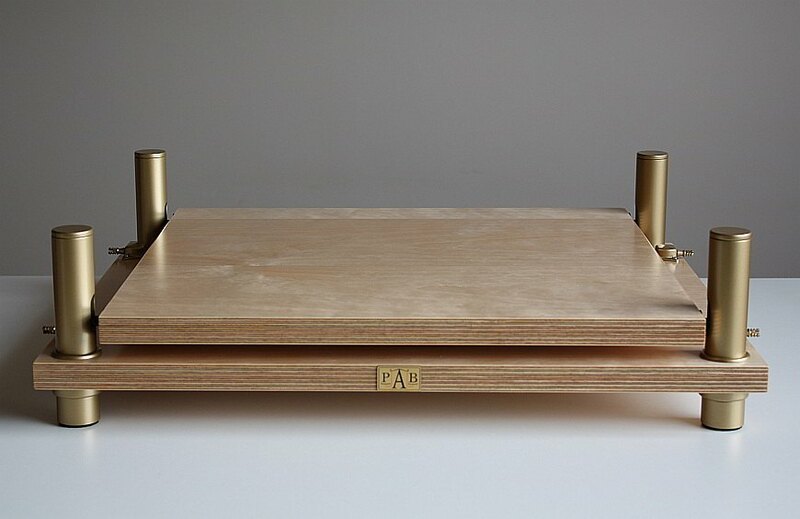 Upon order, we can make any basic anti-vibration platform, made from materials chosen by the client (different kinds of plywood and MDF, covered with natural, modified or artificial veneers, different metals and their alloys, varnished with powder coating, sprayed, anodized, chrome plated etc. ), with the shape and size adjusted to the electronic equipment used and with a design fitting to the listening room. On order we can also finish the shelves and metal accessories with clear coat, mat, semi-mat or high gloss varnishes. Introducing at least one basic platform to the audio system, for example for the CD player or pre-amplifier, will radically improve its sound capabilities. For about 600 USD we can improve the sound of any audio system, while, paradoxically, the improvement in sound will be much bigger in expensive and very expensive systems, than in cheaper ones. 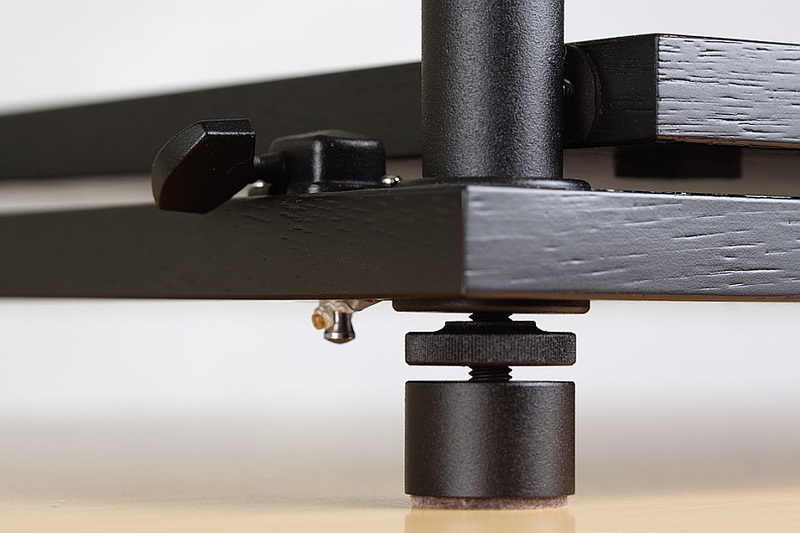 The asset of this platform, as well as other anti-vibration furniture and accessories we manufacture, is the possibility of combining them, by means of using different platforms, racks, feet etc., together in one audio system. 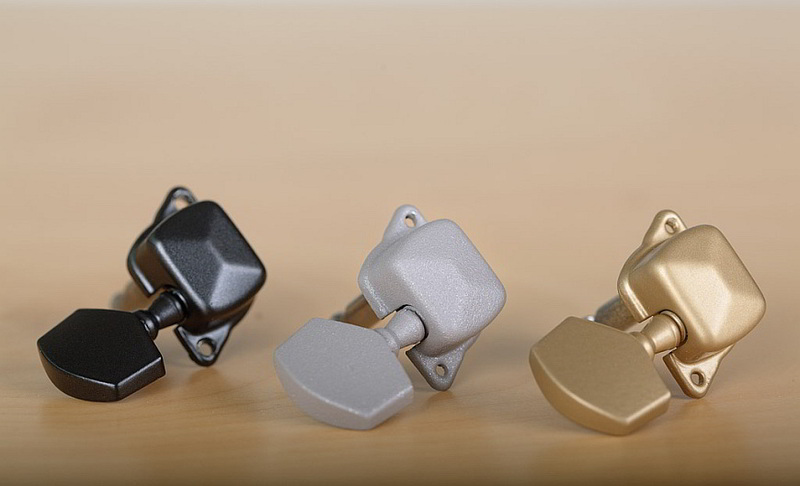 A very good result can also be achieved by exchanging the standard metal feet in the basic platform to PAB bearing feet.